I don’t remember how old I was when my dad first got his home-brewing equipment. Regardless of my specific age, I know I was still young enough to be disappointed when it turned out that the largest present under the Christmas tree wasn’t addressed to me. And, that it wasn’t anything particularly cool; it was just mainly a couple of generic white buckets. Over the past couple of years however, for a variety of reasons, my brewing had tapered off drastically. At the same time, it seems that home-brewing has exploded. Multitudes of people from all over the country and from all walks of life have taken up this once obscure hobby. The temptation is certainly there to greet these eager newcomers with an attitude befitting a caricature of a record store clerk. But, while self-satisfying in a narrow-minded sort of way, it would overlook the most important thing: accompanying the explosion in home-brewing has come a corresponding increase in demand for good beer. And, of course, the beer to fill that demand. So, really, what is there to complain about? Not only that, some of these “newcomers” have taken to the hobby with a vengeance and many possess skills far exceeding my own. 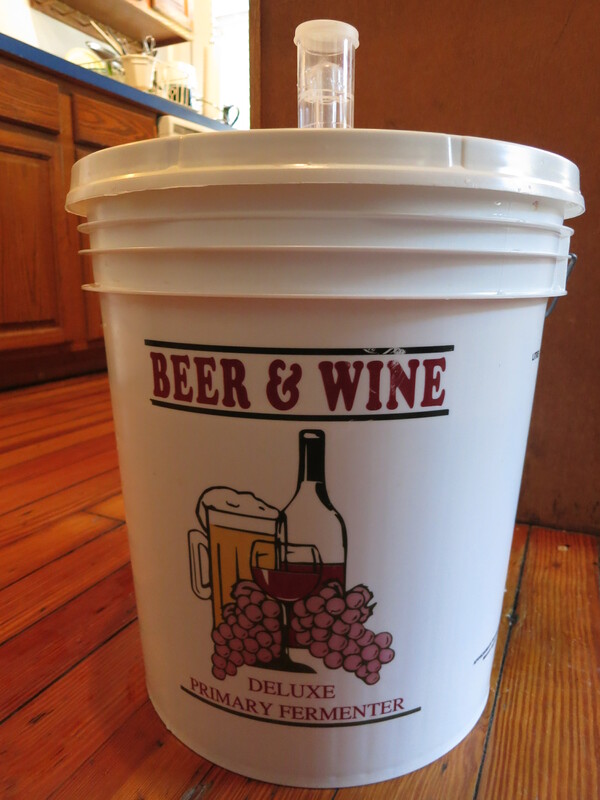 It was with that on my mind, and my own equipment fully and finally in my possession, that I this weekend finally re-joined the ranks of home-brewing enthusiasts. A testament to just how much has changed in the past few years, even the President of the United States has gotten involved in the home-brewing craze. 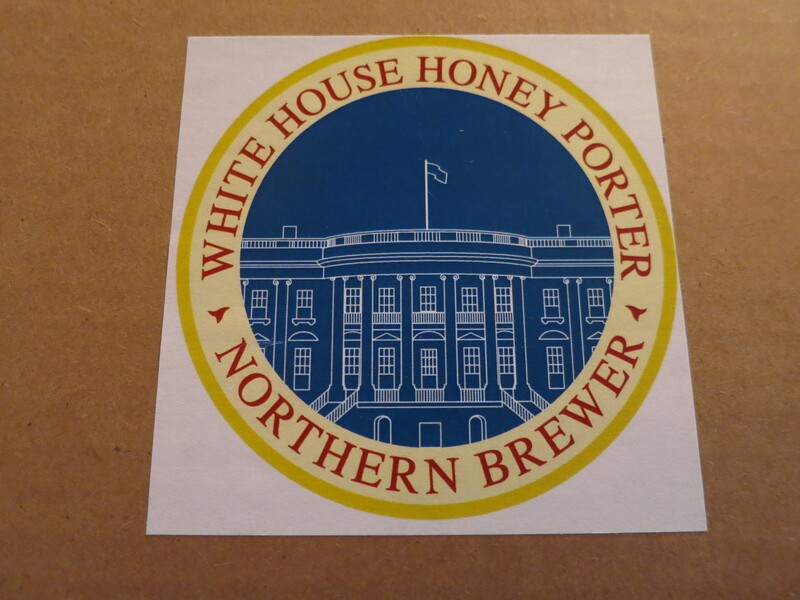 I was already thinking that I wanted to brew up a nice porter for the coming winter months, and when the White House released a recipe for their Honey Porter, I knew I had to make it. The specialty grains before being added to the brew kettle. While there’s nothing wrong with a recipe that is purely extract-based, it’s always fun when specialty grains are involved. They add additional flavor complexities that you just can’t get from extract alone. (Which is one reason so many people eventually graduate to all-grain recipes.) 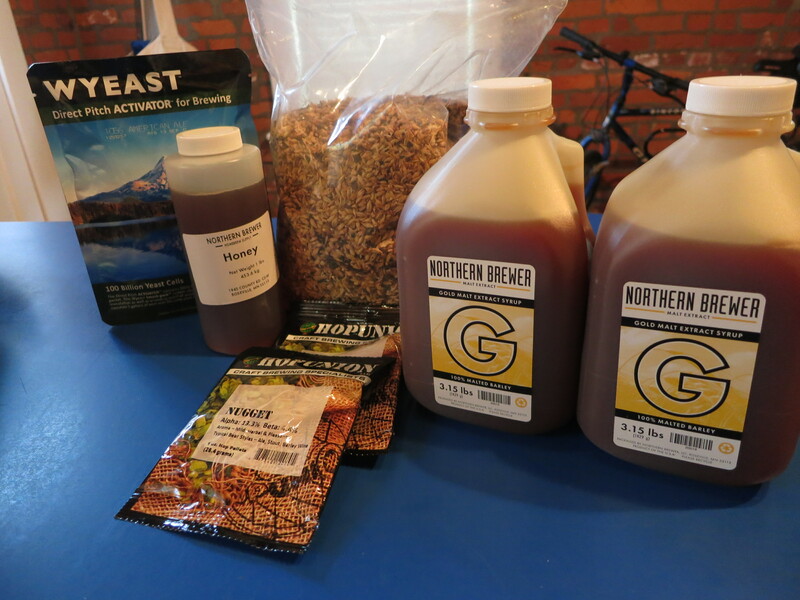 In this case, the recipe called for a variety of different grains: caramel malt, Munich malt, chocolate malt, and black malt. Into the grain bag they all went, and then into the brew kettle. 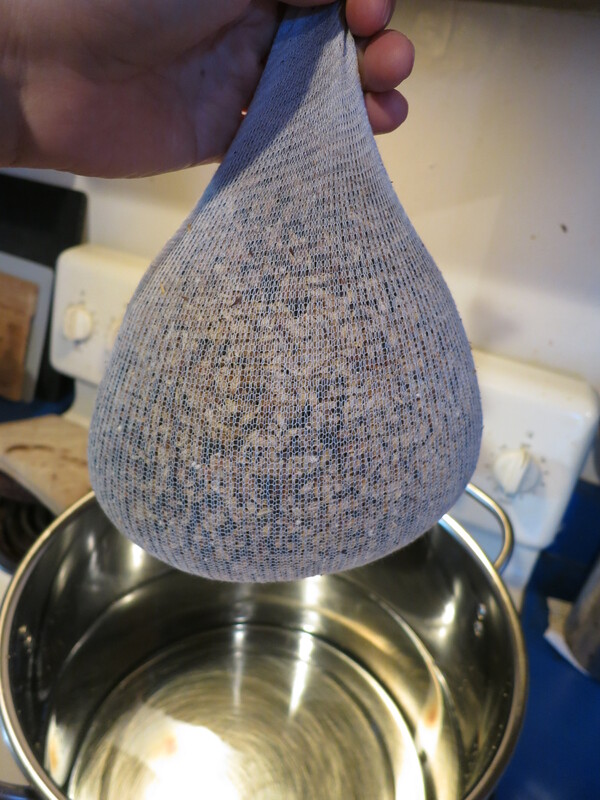 When steeping specialty grains, it’s incredibly important to keep a close eye on the temperature. You don’t want to let the temperature get too high, as it’ll denature the all-important enzymes. Usually you’re looking to keep the temperature at or around 168 degrees or so. Once finished, out come the grains and in goes the malt. (Yep, the picture is blurry. One downside to brewing on your own is that there’s no one to ensure you end up with good pictures. ) 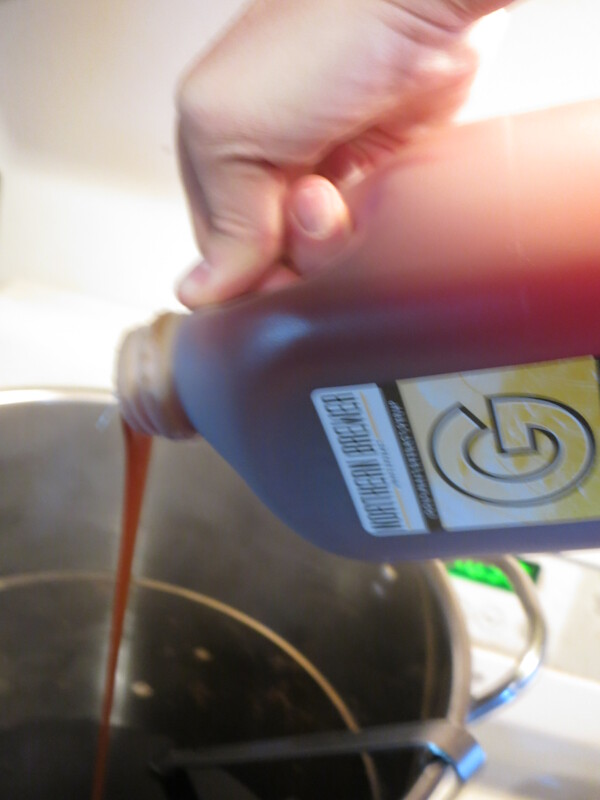 In this case, the recipe also called for a pound of honey, which was added at the same time as the malt extract. From there, the wort boils…and boils…and boils. Periodically into the wort go some hops. The time at which the hops are added to the wort influences the characteristic that they impart to the beer. They can add bitterness, a variety of floral flavors, and/or the heady aroma especially common in heavily hopped beers. Other than adding hops at the appropriate time, the wort can pretty much be left alone during the boil. There isn’t too much to do, and there aren’t too many ways to screw it up. That all changes pretty quickly once the boil is over however. At that point, you need to cool the wort, transfer it to your primary fermenter, add the yeast, and seal it all up. The boiling wort and the wort chiller. Add the chiller about 10 minutes before the end of the boil. 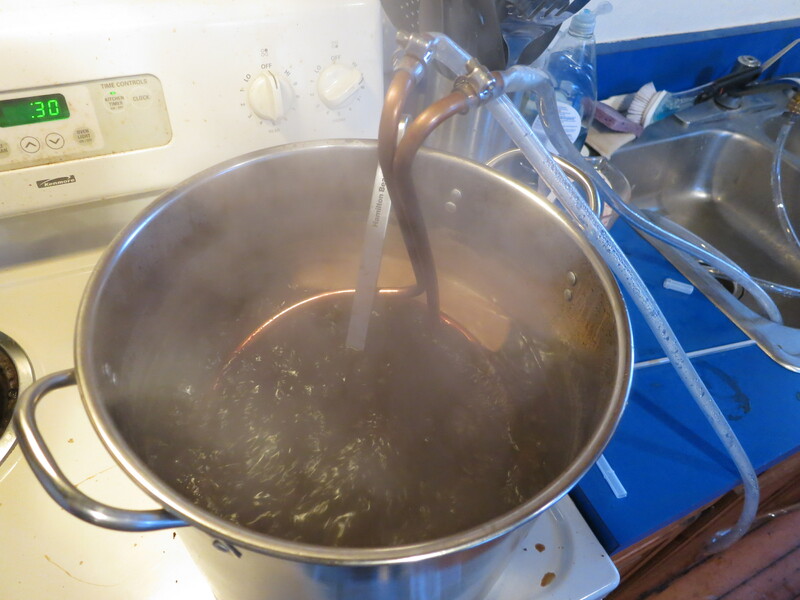 That way, the boiling wort will help sterilize the chiller. – Sanitation, sanitation, sanitation. I cannot CANNOT stress the importance of good sanitation enough. This is something I picked up from my father. As a biochemistry professor, he’s fastidious about keeping his equipment clean and his beer free from contamination. Think back to chemistry class: did you like chem lab? Were you good at it? Those same skills and behaviors are as important—or more—when it comes to brewing beer. – Get a wort chiller. The faster you cool your wort the better. 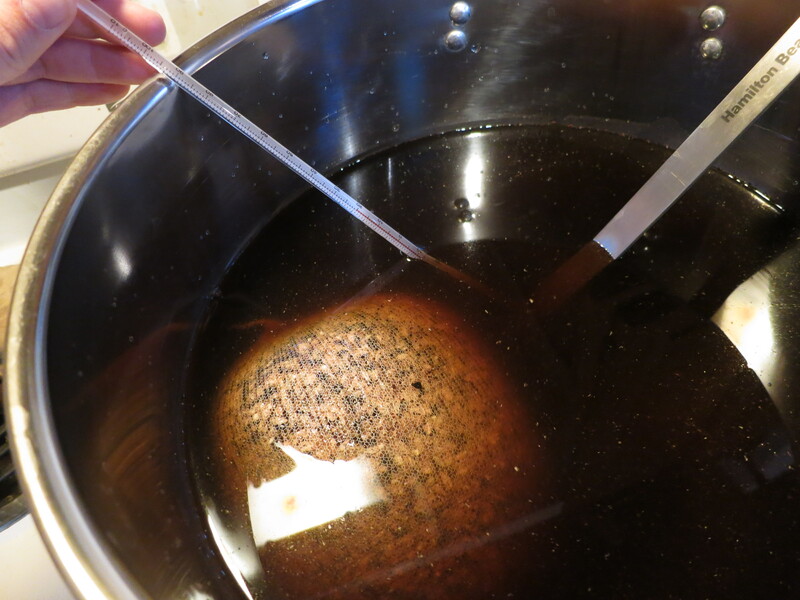 You want to minimize the time that your wort spends between boiling and chilled. The longer it stays warm, the greater chance you have for contamination. It goes without saying, but contamination is bad. Even if it doesn’t ruin your whole batch, even the slightest bit of contamination can impart unpleasant off-flavors. I’ve done the sink full of ice thing. It’s just not good enough. Get a wort chiller; it’s worth it. – Use a whirlfloc tablet. (I prefer it to irish moss.) Add ½ or 1 tablet to a five-gallon batch with about 10 minutes left in the boil. 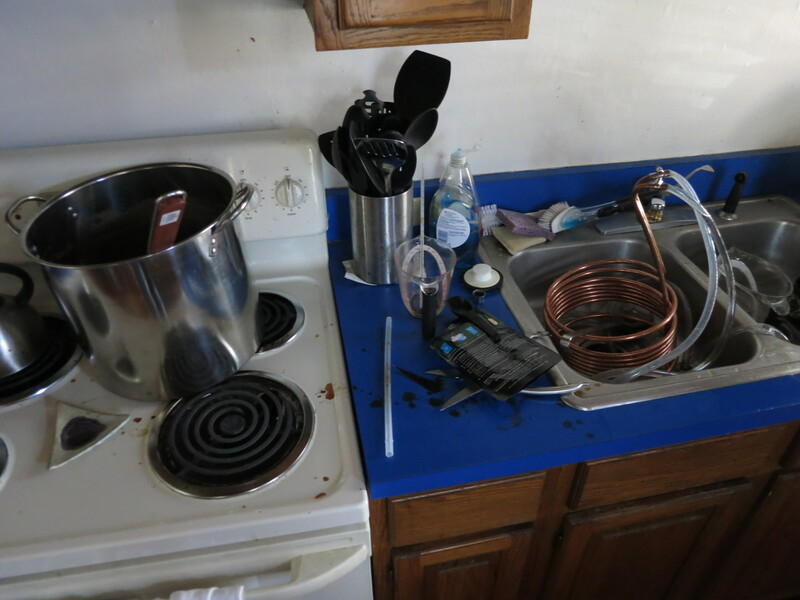 This is probably less important when brewing from extract. Nevertheless, I’ve seen a noticeable difference in my finished beers, with whirfloc batches yielding a clearer end product that is free from haze. – And, channeling my inner Papazian, once that’s all done: Relax. Have a homebrew. Would anyone like to come take care of the cleanup?